This recipe is so simple and easy it feels like cheating that I am even writing it up as a recipe. But it is delicious. You don’t have to cut the potatoes into slices if you don’t want, you could just cut them into quarters and toss with paprika, salt, pepper, and olive oil. But for me, there is something about chicken fat dripping onto potatoes while they roast that gets me a little excited. Yes, chicken fat gets me excited. I am a Jewish woman after all. You can easily throw this dinner together in five minutes after work to feed the whole family. Serve with a simple salad or steamed broccoli for a complete meal. 2. Slice potatoes into 1/2 inch slices. 3. Grease the bottom of a pyrex dish. 4. Lay potatoes on bottom of pan. Sprinkle with salt and pepper and a drizzle of olive oil. 5. Whisk together spices, lemon juice, zest and olive oil. 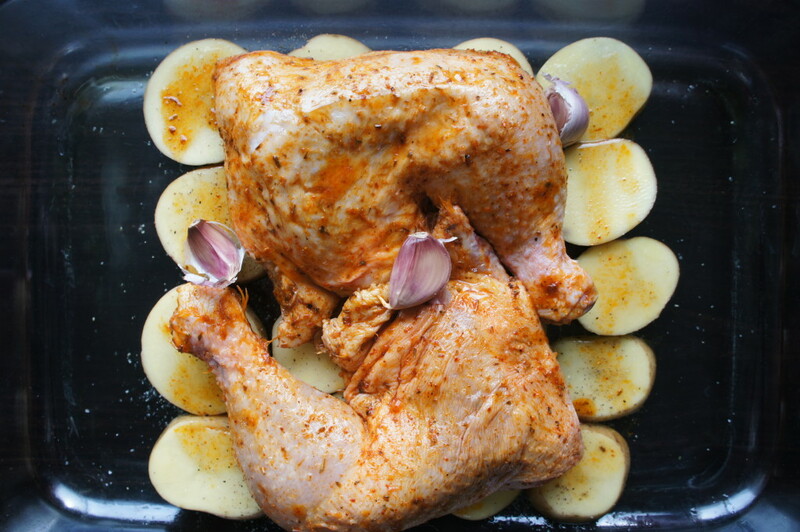 Spread all over the chicken including underneath the skin. Allow to marinate for 30 minutes if you have time, though not necessary. 6. 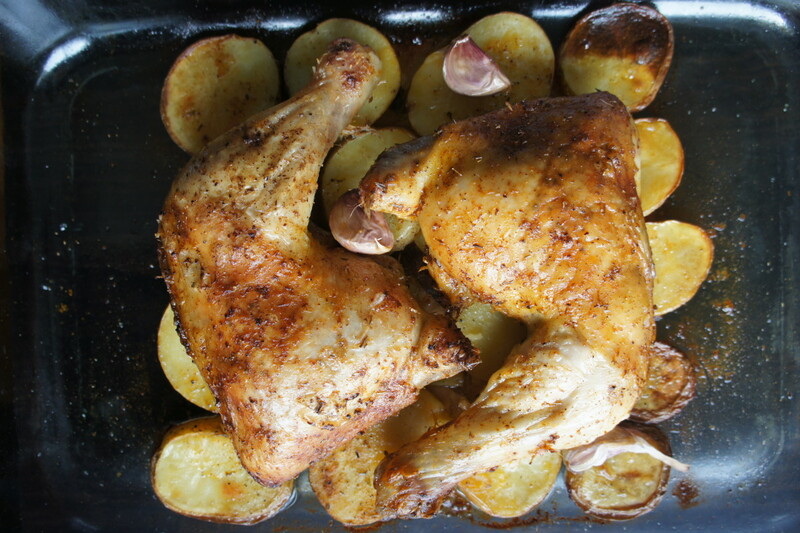 Place chicken and whole garlic cloves on top of potatoes. 7. Roast for 50-55 minutes, or until juices run clear and a meat thermometer reads 160 degrees. 8. Remove chicken and set aside. If you want your potatoes crispier, you can place back in the oven for another 10-15 minutes or until desired doneness.